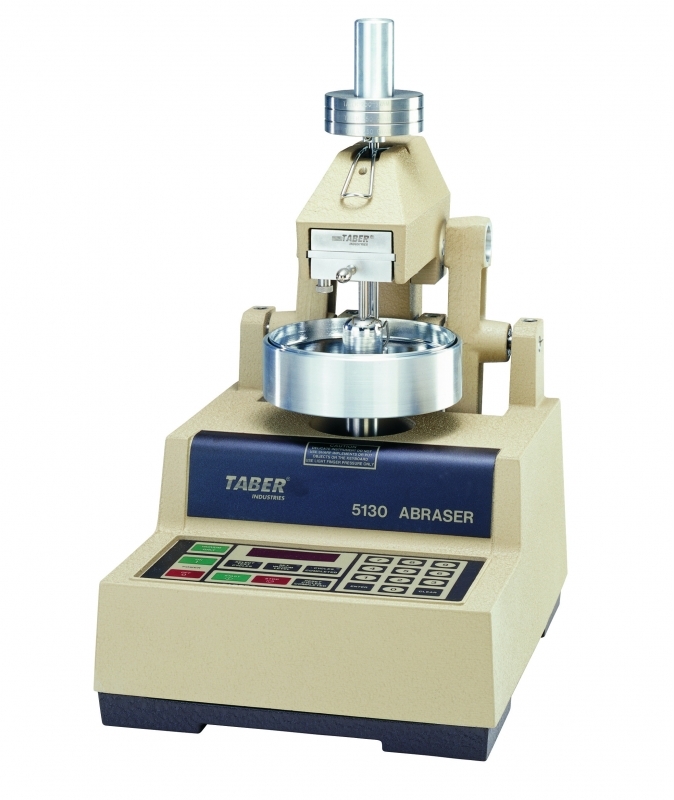 The TABER® Multi-Media Abraser provides a reproducible method to measure the relative abrasiveness of most fluids, powders, pastes and semi-solids. 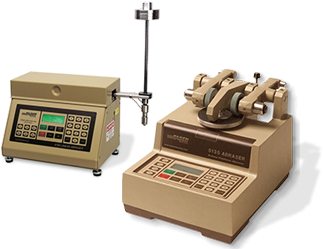 Used in conjunction with the Taber Rotary Abraser, the Multi-Media Abraser is valuable to characterize how these mediums cause wear when they come in contact with different components. The sliding wear concept utilized in the Multi-Media Abraser was first utilized to evaluate different types of adhesive and sealant formulations. The amount of wear observed in laboratory tests correlated well with the amount of wear that different adhesive formulations caused on moving parts in pumps and other application equipment in an automotive manufacturing setting. Additional details on this study are summarized in the February 1997 issue of Adhesives, Sealants & Industry article "New Tests for Determining Adhesive Abrasivity" (2.8MB). The medium to be tested is placed in a specimen dish that includes a replaceable stainless steel wear disc on the bottom. As the dish rotates, an integral drive shaft operates a set of gears which turn the spline shaft. At the base of the shaft is a pin holder with three (3) replaceable hi-grade brass pins that rotate in the opposite direction of the specimen dish. As the test medium flows between the brass pins and stainless steel wear disc, the material acts as an abrasive and causes wear. 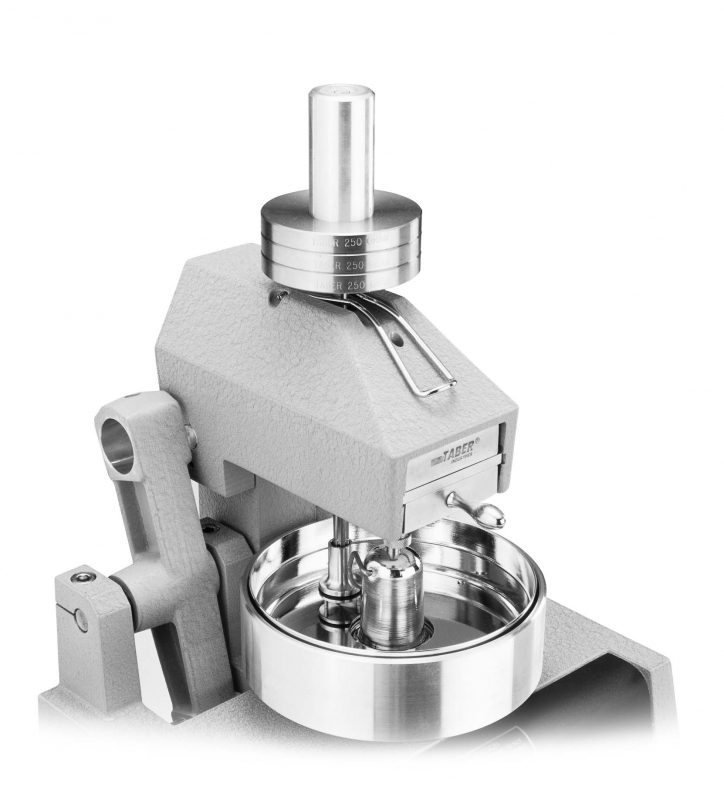 To test a wide range of material viscosities, both load and pin holder speeds are adjustable. The standard testing load on the brass pins can be varied from 250g to 1,000g (in 250g increments with the supplied weight discs). Optional weight discs can bring the maximum load to 2,500g. The rotational speed of the specimen dish is dependent on the model Taber Abraser that is being used. By changing the gearing, the rotational speed of the pin holder can be altered as noted in the table below. The more abrasive or viscous, or larger the particulate size a media presents, the more resistance it adds to the system. Therefore, a lower / slower drive ratio speed should be used. The optional gearing provides a greater range of testing speeds and is recommended for specimen loadings greater than 1,750g or where there is a low percent by volume particulate concentration in the medium. For simplicity, gearing is color coded. Orange - Used to test most materials. Yellow - Results in 23% increase in speed. Recommended to reduce the total number of test cycles; reduce the "fluid wave" in front of the rotating pin holder; level-off the media as it is passed by the pin holder. Red - This optional gear provides a 0.6:1 ratio and is the slowest available speed. As the specimen loading increases to 1750g or greater, it may be necessary to run at a slower speed to supply adequate torque to rotate the pin holder and maintain a constant speed. Green - This optional gear provides a 290% increase in speed compared to the standard gear set-up. Recommended when there is a low percent by volume particulate concentration; low sample loading; and when the rate of wear may be insignificant over an extended number of cycles. Using the template provided in the operating instructions, custom pins or wear discs can be fabricated. Utilizing custom pins or discs made of the materials from your specific application will help you to understand the wear characteristics. The Taber Multi-Media Abraser is available as a separate attachment (Model 5500) or pre-mounted on a single or dual Taber Abraser. Measuring the weight loss of the brass pins provides an accurate comparison of abrasion rates of different media. The pins may be used until 25% of the initial weight is removed. At this point, the pins should be replaced. Note: Centrifugal effects may result in diminishing wear rates as the number of cycles increase due to outward particle migration. If your fluid specimen has particulate matter in it, shake or stir the fluid so it is uniform in consistency. Examine the fluid after 3 1/2 minutes; if the particles separate from the fluid, you may need to alter the test parameters to accommodate the separation. Possible parameter alterations include: insertion of a "paddle" within the specimen dish to redistribute particulate, change of pin holder speed, etc.